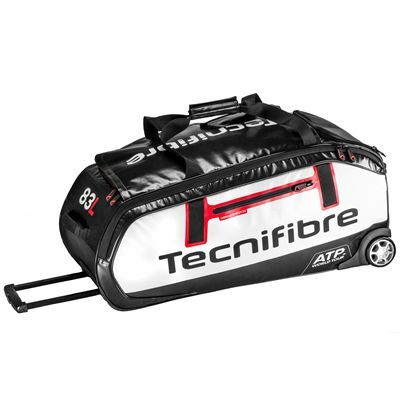 The Tecnifibre Pro Endurance ATP rolling bag offers a lightweight, yet solid and durable construction and can hold up to 15 rackets in its spacious racket compartment. With plenty of pockets for the gear, accessories, footwear and apparel, the bag is a top pick for travelling players who want a lot of space for their equipment. To separate shoes from the rest of your belongings, there is even a special ventilated footwear compartment and the bag features a trolley carrying system with aluminium wheels and two handles to ensure convenient transportation. Thanks to extra resilient tarpaulin material, the bag is ready to resist extreme conditions of the ATP World Tour and guarantees excellent protection of your rackets. for submitting product review about Tecnifibre Pro Endurance ATP Rolling Bag.